'Maximum Volume: The Life of Beatles Producer George Martin, The Early Years' – exclusive extract. Beatles Radio: The Beatles, Solos, Covers, Birthdays, News The Fab 4 and More! 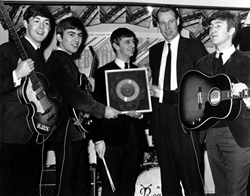 The day after The Beatles’ Cardiff show, manager Brian Epstein and the bandmates met with Walter Shenson, the producer who brought them to the big screen in A Hard Day’s Night and Help! While the meeting was certainly less climactic than the previous evening’s concert, the day’s events held great portents nonetheless. Brian had arranged the meeting so that Walter could pitch a third feature film to the group. This time, the deal involved another property for United Artists titled A Talent for Loving. Based on Richard Condon’s novel of the same name, A Talent for Loving would depict the four lads from Liverpool transplanted into an 1870s-era western as pioneering frontiersmen. But for the first time, the Beatles weren’t having it, voting unanimously – all for one and one for all, as was their practice – to reject Shenson’s gambit outright.